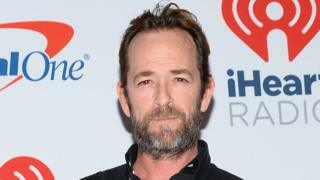 Unlike many television actors, Luke Perry's celebrity and fanbase straddled generations. Those who grew up in the 1990s will remember him best as brooding heartthrob Dylan McKay in Beverly Hills, 90210. But many younger fans know him as Fred, the father of Archie Andrews, from comic book adaptation Riverdale. Since news of his death broke on Monday, fans young and old have been sharing their memories of, and warm encounters with, the late star. Like many others her age, Deborah Muller was a big fan of 90210 growing up. She remembers that the show was all that her friends used to talk about and Perry's Dylan was always her favourite. In 1994, when she was 20, she spotted the actor among other celebrities at the opening of a Planet Hollywood restaurant in Orlando. "I was so shy back then, he was eating and I didn't want to interrupt him," she tells the BBC. After she got the courage to interrupt him, she recalls him being gracious, friendly and taking extra photographs in case her eyes were closed in the first. "He was just the most humble and gracious and so very nice of all the people that I met that night," she says. Since learning about his stroke, she had been checking articles on the internet all week to try and get an update on his health. "I can't even explain the sadness that I'm even feeling right now," she says, after seeing the news of his death on a friend's Facebook page. "When I saw that literally just tears rolled down my face and I was searching all over to find that picture." For many people, the character of Dylan McKay was their first on-screen crush. One Twitter user named Jennifer Quirino, from California, shared photographs of her meeting her idol back in 1997. She remembers being woken up by her mum, and the two rushed to a local K-mart grocery store where Perry was scheduled to be. Jennifer waited for more than an hour for the actor, armed with a collage book of photographs of him ready to be signed. "My heart stopped," she says. "He saw me crying and jumping up and down and walked over to me and hugged me and wiped my tear and said, 'Honey don't cry, people will be afraid to come to K-mart.'" Another childhood fan of 90210 was Don Sparrow, who is an illustrator living in Canada. 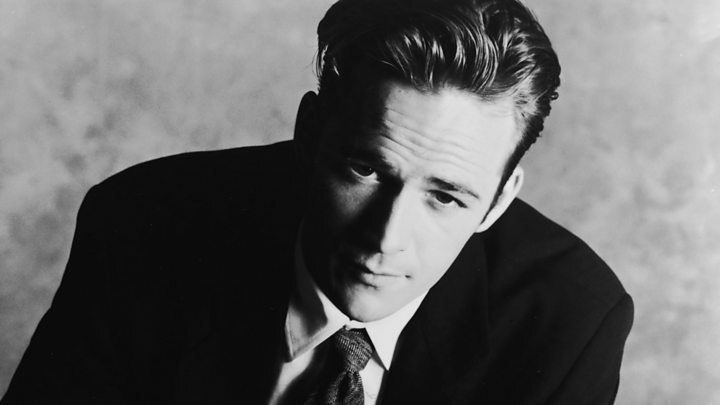 Image caption In the 1990s, Luke Perry played brooding heartthrob Dylan McKay in TV series Beverley Hills, 90210. He started watching the show back when he was 10. The guys on the show, to him, were the epitome of cool and were always a source of inspiration. "To that end, I still comb my hair up in that sort of James Dean quiff he had," he says, while laughing. In 2016 Perry and some of the show's other stars were announced for a comic convention near to where he lived in Calgary. Don knew he had to buy tickets for his super-fan sister Shawna's birthday. The two even made custom Peach Pit (the diner on 90210) uniforms to wear along to the meet-and-greet. Don created a custom artwork of the three stars ahead of their meeting. "We met them in a sequence and Luke Perry was the last one," Don says, recalling how the actor inundated him with compliments about his artwork. "I said: 'Well if you like it, you could have the original'," Don recalls, "And he said: 'Are you kidding? Are you serious? And he jumped up from this table and came around and hugged me!" He described being overwhelmed with guilt about the embrace - as his sister had been "in love" with Luke since the two were children. "So I said to him: 'You do realise you're going to have to hug my sister?' and he said; Hug her? I'll lift her off the ground!'" "And he did, he swept her up and spun her around," Don says. "It was just such a magical weird moment," he explains. "He was sort of known as this brooding character, but he was so charming and so friendly." Don too, had been checking news of Perry's health since news of his stroke broke. "It's just shocking because he was such an icon to me, but also so young. I mean it was very, very surprising." Annabel Rackham works as an entertainment reporter for the BBC and is herself a big fan of Riverdale - which airs on the CW network and on Netflix. She explains that as the father of protagonist Archie Andrews, Perry's character has been central to the show for a number of years. "He's been at the forefront of this TV show for around three years now," she explains. "Despite him being 52, he had a lot of young fans and you can see that by the reaction on social media. "This isn't an actor that had faded into obscurity. This was someone that young people were used to seeing on a very, very popular drama week in, week out."